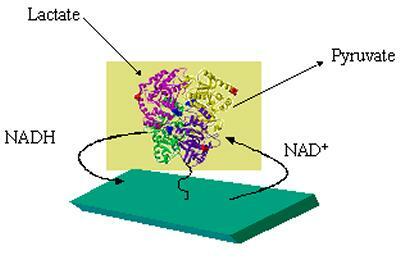 A continuing interest in the group is in the application of biological electron transfer processes in sensors, synthesis and in bioelectronic devices. Over recent years work has concentrated on the use of electrochemical polymerisation to immobilise active enzymes at surfaces, the modeling of the coupled diffusion and reaction processes in amperometric enzyme electrodes, and strategies for the electrochemical turnover of redox enzymes. These activities are continuing with emphasis on the design and construction of integrated chemical systems incorporating functional biological components. In collaboration with Professor Kilburn we are developing high throughput methods for the discovery of chemically modified electrodes for NADH, ascorbate or dopamine oxidation. This work combines the use electrochemical coupling strategies to attach molecules to electrode surfaces with solid phase synthetic chemistry methodology to create libraries of redox mediators attached to electrode surfaces. Finally we remain interested in the modelling of electrochemical biosensor responses in order to understand the interplay of non-linear reaction kinetics and diffusion and as a tool for the design of optimised electrochemical biosensors for specific applications.